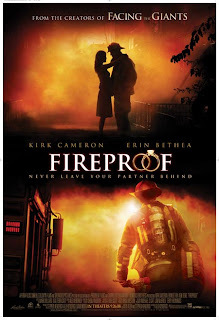 Ok, so I know that Jonathan and I are really behind the times here, but we just watched the movie Fireproof the night before last. (This fact will not surprise Jennifer in the least.) When this movie hit the theatres, everyone we knew went to see it and told us how fabulous it was and how we should absolutely make a point to go and see it. We understood that the movie did pretty well in theatres and that it "had a strong message in support of marriage." Well, we're slow to get to movies and date nights don't consist of movies unless we really, really really want to see them. But when it came out on DVD we picked up a copy. And then we sat on it for months on end and finally decided to watch it. First up, I've got to say that the acting is almost hilarious at times. You can definitely tell that this was not a high budget film. I'm not saying that to pick on it (if you were one that told me to watch it!) but just sayin'. It lacks in certain areas. However, I also acknowledge that if people like me would go to the theatre to see movies like this, production companies would more easily take the point home that there is a large percentage of the population who want to go to the movies to be entertained in a clean and healthy way. The main message of Fireproof , in case you are still as I was, and rather clueless, is that marriage is worth fighting for. The couple in this movie, Caleb and Catherine, have drifted apart from one another. She doesn't respect him properly and he doesn't love her properly and they both want "out." If not for Caleb's father stepping into the picture and challenging Caleb to participate in a 40 day "love dare" to restore the communication and health to the relationship, Caleb and Catherine would have gone their separate ways. As Caleb is a fireman, the point is also made that in a fire you are never to leave your partner's side. You stick together and work together to put the fire out. It's an analogy that has sticking power because anyone who is married knows that marriage is not always a walk in the park. Sometimes the challenges that face a couple in a marriage are so overwhelming that you feel like you can't face them alone. And, in truth, you really can't. The movie's heavy emphasis is that without Christ being present in a marriage, it is more likely to crumble. WITH Christ, it is possible to overcome any season of difficulty. It does take two to commit to that though. I'm not here to get into a debate about marriage and divorce. In fact, I'm going to totally sidestep the issues surrounding divorce for the purpose of this movie review/discussion. In the movie, a third party tries to effect the marriage relationship by stealing the affections of Catherine. The message that Kirk Cameron delivers as the husband of Catherine is that HE is still husband to Catherine and he very much did not appreciate this third person interfering with the marriage relationship. That is really quite true on many levels. As the Bible says, when two people marry, they become one. It is a mystery and yet it is truth. No longer is it just "Carrie for Carrie" or "Jonathan for Jonathan." It is "Jonathan for Carrie and Jonathan under the headship of Christ" and Carrie is for the same thing. You can't step in and mess with either one of us and have us be singled out. We stand together "for better or for worse, for richer or for poorer, in sickness and in health." This is the message that the message promotes. Marriage is a covenant and not a contract, and, in fact, the movie concludes with Caleb and Catherine reaffirming their vows to one another, not just as contract but as lifetime covenant and commitment. We stand together in all things. Furthermore, we pointedly asked our parents and families to take a vow in front of the same God and the same witnesses to support us in this endeavor. They vowed to not attempt to separate us in their own thoughts, words and deeds. They were to commit to recognizing that we were not individually Carrie and Jonathan any longer. Instead, we were a new entity. When we were watching the movie last night I really appreciated the role that Caleb's father played in stepping in and encouraging the younger couple to stand with one another. That said, he did not encourage them to stand in their own strength. Rather, he encouraged them to stand firm in Christ. He did not pay any heed to Caleb's complaints about Catherine, nor did Caleb's father voice his own complaints about Catherine. Instead - Caleb's father stood for the ONE unit that the marriage represented. This movie paints a powerful picture of what things could be like if we, as a society valued marriage. If we were quick to support each other in our vows and remind one another of them, maybe marriage would stand a better chance. Don't leave your partner in a fire. You stand firm. You do not back down. In conclusion, if you haven't seen this movie then let us join the crowd in saying, "You GOTTA make time for this one!" The message is worth it all. Thanks for the review Carrie, I'll put it on the Netflix list! I think the acting is better on some of their other movies - we liked Flywheel a lot. Facing the Giants is good too. I also delayed watching the movie. First, because the closest theater showing it was over an hour away. But mainly because of the hype. I agree it's a great movie. But. I wonder how many women out there missed the point that it's about changing YOURSELF and not your husband. And even if he's still a jerk after you've finished the 40 days you keep on respecting him and acting as one. I'm one of the few who still hasn't seen this one... Thanks for sharing your thoughts. Thanks for this review, Carrie. My husband-of-17-years and I are both Christians, and I can say that if we did not put God first in our lives, our marriage would not be as solid as it is. Ecclesiastes 4: 9-12 says it best. Okay--I missed this post, even though you called me out on it!! I haven't seen it either, so there! But it's in my Netflix queue, and we're going to watch it soon. I appreciate your review.